An often nice, shy, modest and considerate skunk. But sometimes, he is possessed by great courage and lack of empathy. Maybe it has something to do with his role as spiritual guide. When not doing anything related to his spiritual guidance role, he is very shy, easily scared and easily embarrassed small skunk. But his personality changes drastically when on duty. He becomes strong-willed, ruthless and unforgiving. Likes peace, staying calm, order and silence. Hates being naked, embarrassed, made fun of or wetting the bed, which happens almost every night. Ivan invaded his village long ago, in his plan to conquer Ilha Maior. He burned all females, including Renato's loved mother, and enslaved all males, including Renato's father. Renato managed to escape with his babysitter. Living alone and traumatized by what happened, Renato could not develop very well. One night, he had dreams in which the Earth spoke to him, about a scepter that could be found in a cave nearby. Turns out that the same dream happened to a handful of people, but Renato was the only one to actually answer it. He went to that cave and got the scepter in there. The spirit of the Earth, as well as the spirits of deceased sages, could speak to Renato through the scepter. Renato became the next Earth sage and recevied his first mission, which was to free his people from Ivan's grasp. Being a coward, Renato didn't think he could do that at first, but he also felt that he was given powers that were out of measure. Indeed, he had supernatural power after acquiring the scepter, but only when he had a mission to fulfill. Whenever he was given a task to accomplish, he shows his true colors. The colors of a kid raised without parents, to whom is given cosmic powers. Whenever in mission, he becomes serious, arrogant, selfish, unforgiving. Plus, having the feeling that he "needs to do" something, he won't listen to humane feelings such as empathy or compassion, which leads him to kill guiltlessly. When his people was freed, Renato found them a spot in the forest where they could live. However, Renato fell in love with a wound vixen, who was old enough to be his mother. Being the new spiritual guide of the village, elected by the very people he freed, Renato wasn't allowed to be seen with a grown female who wasn't his real mother. They lived together, secretly, with her spoiling and pampering Renato. 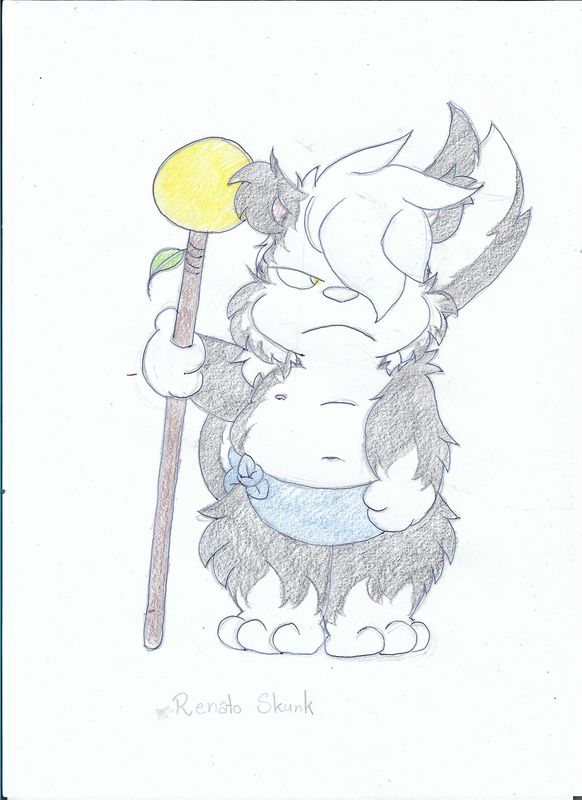 That made Renato shy away from his responsibilities, as a spiritual guide in a tribal setting is also governor. He didn't want to legislate anymore. He was judging less and less causes. He was living like a child needed to live, but it seemed like he wasn't allowed to do that for long. With the people divided, they couldn't withstand an assault by nearby tribes. Due to his irresponsibility, Renato's powers were lifted and he could do nothing. When the assault was over and the territory was taken, the first to leave Renato behind was the vixen who adopted him. He was banned and the people sworn to murder him if they saw him again... With a second trauma in his head, Renato arrived to another village, where he restarted his life, that time as a regular citizen. But the wisdom from the Earth quickly made him noticed and the people began to want him as new ruler. Renato tried his best to refuse, but indeed, he was the most capable, thanks to that supernatural help. His powers returned slowly, but he felt like he wasn't allowed to have fun. Learning from his mistakes, but still doing an exaggeration, he vowed ascetism. No one. He wants a mother, really badly, but won't allow himself to have one. Ilha Maior, Fenária. But in a different time than Yure's. Renato lives 2500 years before Yure was even born. Black and white skunk. His white stripe is big enough to cover a large portion of the face. A blue "nappy", which is actually just a tied piece of cloth. A stressed and sexually frustrated ball of hard feelings.